RIGI-I Pathway – Kineta Inc. The RIG-I pathway has been well studied in infectious diseases. The immune stimulation, inflammation and cell death mechanisms can be also exploited to kill tumor cells, trigger an immune response and turn cold tumors hot. Kineta’s small molecule drugs trick tumor cells into thinking they are infected with a virus, an effective anti-tumor mechanism. 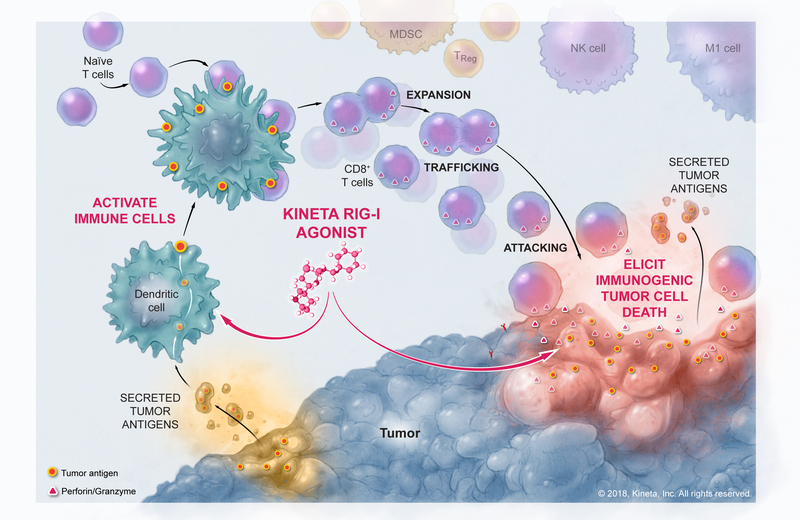 This dual drug mechanism and strong selectivity in tumor cells makes Kineta’s RIG-I program unique and differentiated from other immunotherapies in development. Additionally, Kineta’s small molecule approach is further differentiated from competitors due to the potential of administering orally or intravenously.